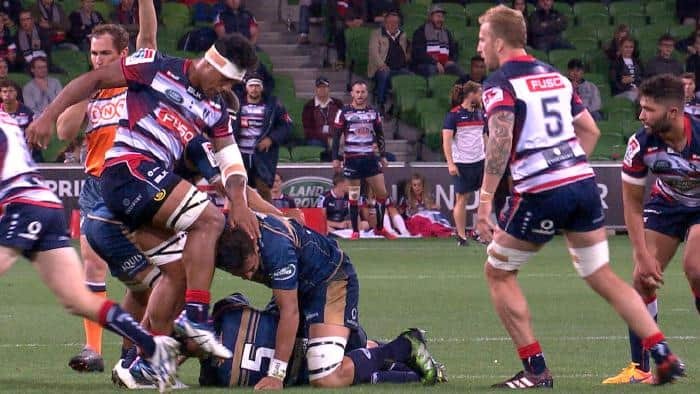 Melbourne Rebels star Lopeti Timani has been handed a four week ban after kicking Rory Arnold in the head during their 19-17 win over the Brumbies on Saturday. The back-row was shown a yellow card on the day after a TMO review. It was the Rebels first win of the season, but they will now be without Timani for their fixtures against the Sharks, Kings, Lions ands Reds. “Having conducted a detailed review of all the available evidence, including all camera angles and additional evidence, including from the player and submissions from his legal representative, Michele Williams, the Foul Play Review Committee amended the citing to Law 10.4(m) Any other acts (not previously referred to) which are contrary to good sportsmanship. “With respect to sanction the Foul Play Review Committee deemed the act of foul play, which involved an intentional, but glancing, strike to an opponent’s head by the Player’s leg, merited a mid-range entry point of eight weeks. “However, taking into account mitigating factors including the player’s excellent Judicial record, his on-field apology to the opposing player, his remorse and his early guilty plea, the Foul Play Review Committee reduced the suspension to four weeks. What do you think? Deserved?